THE REVIEW: Valkyrie plays as a good history lesson and depiction of one plot to assassinate Adolph Hitler during World War II, but it is not the greatest film and could improve on how it teaches us about Operation Walküre. The acting, set decorations, locations, blocking are all fantastic and are as good as any other World War II film, but not enough time is spent on key scenes and it feels like you are abruptly taken out of moments before they’re fully completed. The result is a film (and a story) that ultimately has a nail-biting finish, but everything else is just a blur and distorted sense of time. Periodically throughout the film, there are subtitles to let us know where and when we are. The earliest time listed is March 13, 1943 in Russia when Major General Tresckow (Kenneth Branagh) attempts to place a bomb on Hitler’s airplane. From here, the film takes place over the course of a year and ends with Operation Valkyrie on July 20, 1944. That’s a total of sixteen months and yet the film feels like it took place in only one. A large part of this problem, I believe, is due to the editing and cutting off scenes before their natural ending point. Many of the action scenes were edited well — like Col. Stauffenberg (Tom Cruise) at the Wolf’s Lair or Berlin during Operation Valkyrie — but all of the build up to the action (i.e. plotting the assassination) are not. A great example is when Stauffenberg is explaining his idea for the first time to Tresckow. He’s rewriting Valkyrie (originally a way for Hitler to retain power in the wake of a coup) to focus efforts in Berlin so the resistance can obtain power quicker and expand afterwards. During the explanation we even get a map to help us understand the plot better but almost as soon as Stauffenberg is finished explaining, the scene is over. Tresckow mysteriously disappears, never to be seen again (he’s not the only random disappearance) and then we’re on to Lt. Haeften abruptly joining Stauffenberg’s staff and signing on to Operation Valkyrie. A brief note about casting, which normally never bothers me but in this case it does, why are the majority of German officers portrayed by English actors? Director Bryan Singer does an interesting thing at the beginning of the film to establish why all dialogue is in English instead of German (a monologue by Stauffenberg starts in German and slowly transitions to English), but that doesn’t explain why you couldn’t find at least a few more German actors. As great as Kenneth Branagh, Terence Stamp (who plays Col. Gen. Beck), and Kevin McNally (Dr. Goerdeler) are, it’s slightly blizarre to see them in the major roles. Most of the minor characters and extras are German (or at least appear to be), so why not try and get at least one or two of the key characters to be German? THE TAKEAWAY: As a historical event, Operation Valkyrie is chock-full of suspense, intrigue, and drama as you follow a group of dissenters attempt to assassinate Hitler and overthrow the Nazi regime. While the film Valkyrie does a good job at introducing the whole idea and conveying the action-parts of the plot, most of the scheming that went into the plan is all but lost through vague and abrupt cuts and not spending enough time on key moments. Easily recommended for history buffs and period-drama fans. 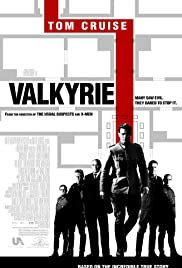 It may not cover every minor detail of the plot, but Valkyrie is sure an energetic and exciting look at the final organized attempt to remove Adolph Hitler from power.